Most guide books and ‘how to do it’ publications about the waterways concentrate on technical aspects – how things work, how to operate locks and boats etc. They do not deal with the interaction between boaters. 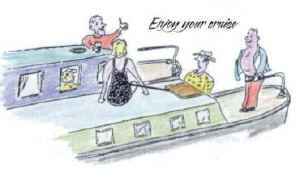 These notes are intended to encourage everyone to help each other enjoy cruising the waterways. They highlight some common situations where this might be appropriate, where aggravation could be prevented by mutual help, thoughtfulness and understanding. We hope to encourage the more experienced boater to offer advice and assistance in appropriate circumstances in a spirit of friendship; and the less experienced to seek advice or ideas and to evaluate advice given in good part. Not all hirers are novices; some private or shared ownership boaters are. Many hire boaters have several years’ experience and some private boaters have very little! We are all people with a common interest in the waterways who have just not yet become friends. The organisations which have produced these notes hope they will help you do just that. 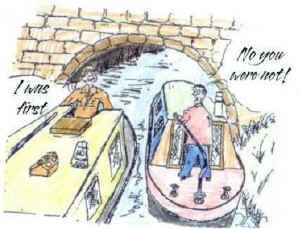 The notes have been produced mainly with canals in mind, but are just as relevant for river boating. Currents, weirs and changing water levels on rivers may bring extra hazards and lock procedures may be different. It has been a tradition since the days of the working boats to acknowledge each other with a cheery wave – join in! Don’t be selective about whom you acknowledge and don’t forget other waterway users – we are all trying to enjoy the same experience. There really is room for all lovers of the waterways whatever their interest. It costs nothing to be considerate and allow for the other person’s inexperience. A disagreement or a frustrating experience can stay with you all day, make you less relaxed and more likely to make mistakes. Take it easy – there are no prizes for being first! Boating is the fastest way to slow down – so try doing just that! If you are reading this on a boat then you are already well on your way to that well earned rest. Relax, take it easy, don’t plan to do too much in a day. Allow some slack time in your schedule for holdups, because there will be some! Do not cause a breaking wash – this can easily happen in shallow water even at low speed – it erodes banks, reducing depth with the resulting silt, and eventually making boating more difficult for everyone. Be aware that a boat draws water from ahead and the stern goes deeper into the water the faster the speed – reducing the available depth of water and increasing the likelihood of grounding, particularly near the bank. Slow down passing on-coming boats because there is less room available for each boat, so less room for error. 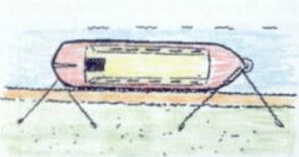 The movement of water can cause one of the boats (if not both) to end up aground. Slow to tick over (max 2mph) before you pass moored boats – otherwise you may cause the moored boat to rock significantly which is a safety hazard if someone on it is pouring boiling water or using a power tool, for instance. You might also pull out the moored boat’s mooring pins and set it adrift. It is rare for there to be a need, let alone a safe opportunity, to overtake a slower boat. Best to relax and enjoy the view. If you are consistently being caught by another boat and you don’t wish to increase your own speed, find a suitable straight stretch and slow or stop to enable the other boat to pass safely. Indicate your willingness to be overtaken. Legs and arms are not designed to stop or fend off boats from other boats, bridges or other structures. Limbs will break first! Similarly, keep limbs within the boat when cruising – don’t sit astride the bow with legs dangling – you could lose them in an emergency. And watch out for bridges if you are on the roof! Don’t be offended if a passing boater mentions these things; it could just prevent a nasty accident. Use rings or bollards where you can, they will be firmer than spikes. Tie ropes fairly tightly to reduce movement caused by passing boats which can pull out spikes or break ropes. Drive mooring spikes deeply into the ground, to reduce the chance of them being pulled out by a passing boat. And tie the rope as close to the ground as you can. Tie the line to the spike, don’t just pass it around – if the spike comes out at least it will stay attached to the rope! Where there are steel pilings, try placing the spike immediately behind a pile – it reduces the chance of it being pulled out and keeps the spike off the footpath. Where the spike is close to the towing path, attach some means of warning. Are you fed up with having your mooring pins pulled out by boats going by too fast? Fed up with being rocked? Try mooring like this – it is called setting spring lines. You take a mooring rope forward and behind the mooring cleat to reduce the potential for the boat to swing back and forth. 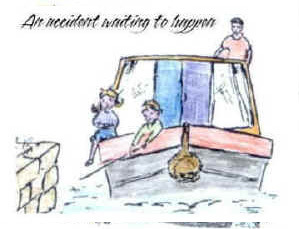 Please don’t leave spaces between boats on popular moorings – very often the sum of the spaces left by not sharing bollards or rings would have enabled another boat to moor. Be prepared to ‘breast up’ side by side at crowded moorings where the waterway is wide enough. Offer an incoming boat the opportunity to moor alongside you – it could be the start of an enduring friendship. Don’t block the towing path by tying to a fence or tree in the hedge – even temporarily. It can be dangerous as well as annoying to tow path users. Centre ropes are useful for holding a boat in position temporarily but don’t rely on them when mooring properly. A well moored boat should need no more than bow and stern lines. Don’t moor in such a way as to prevent another boat arriving from using the facility – leave all the space (70 feet if you can!) ahead or astern rather than a short bit at each end! Moor only to use the facility, and then move off. Don’t stop there for a meal or – worse – leave the boat moored up with no one in attendance. If you don’t have an alternative, at least leave your hose connected to offer to others wishing to fill with water, and invite them to come alongside. It takes the aggravation away! Racing an oncoming boat to be first through a bridge is rarely productive – you will probably both have to stop, or worse, you will crash. Much more relaxing to give way and signal the other boat to come through. You’ll soon learn to judge who is nearest the bridge and thus has priority! Alternatively, use the rule that the boat nearest the towing path, and therefore with the deepest water, gives way. 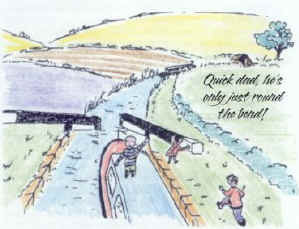 On rivers and canals with a current, boats travelling upstream should give way to those coming downstream. Locks offer some of the best opportunities for contact with other boaters. Some of your most memorable and useful conversations will be with others using the lock. Proper and efficient operation helps everyone. At busy times be aware there might be a queue to use the locks and actively enquire rather than pass others who may be queuing. Leave plenty of space (at least 70’) behind you for the next arrivals at lock landings to moor safely. Whilst waiting to use a lock after someone else, why not have a couple of your crew go to help at the lock. It makes for a friendly few minutes, it shares out the work and they will enjoy the company – they may even learn something! Offering to help a (slow) solo boater will usually be appreciated and will help you along too! If you are helping someone, try not to take over the entire job and make sure you are not just passing on bad habits! Open top paddles slowly. Beware those who say ‘we’re in no hurry’ or ‘I’ve all the time in the world’. They’ll probably want you out as fast as possible and work the paddles like demented demons (do you do it yourself, perhaps?)! Always try to share wide locks between two (or even more!) narrow beam boats – it makes less work for a start! If one crew seems to be less proficient, use the opportunity to share your experience productively. There are no rules about who goes in first – you can’t close the gates until you are both in! Some thoughts are – full length boat first and get behind gate, boat with bow thrusters first – it may have more control over bows whilst the second boat comes in; longest boat first; steel boat before fibreglass etc. Discuss your options with each other and have a plan, especially for a flight of locks. Then you’ll be efficient, safe and have fun! Don’t force on people the idea of travelling through a broad flight roped together side by side (‘breasted’ ) – hire craft are not insured for it – and it can look like showing off! It is not much quicker, and anyway, who’s in a hurry? If a flight is busy in your direction, resist the temptation to re-set the lock for your boat to use if there is an oncoming boat a couple of locks away. You will only waste water and probably get into a queue in the next pounds where you’ll get in the way of other traffic. On some flights, you could even flood or drain the pound. If you see a boat coming, leave the gates open for them – it is a courtesy and less work for you! Better still, actively look for a boat coming, even to the extent of going to a nearby bend to look. It is no fun having a lock gate slammed in your face when it was ready for you! Always let an oncoming boat use your next lock if it is set for them, even if they are a couple of locks or several hundred yards away. If you can, travel a flight of locks with at least one crew member working ahead so approaching boats will know you are coming – this saves water and can avoid accusations of stealing locks where in fact the other boaters did not know you were there. Do not work more than one lock ahead to avoid delaying an oncoming boat unnecessarily, unless the next couple of locks are already in your favour. Where intervening pounds are short, ensure the lock below is filling as the upper one is emptying, it saves water. 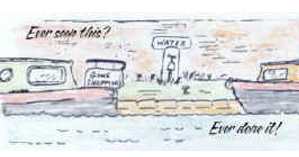 Except at signed moorings, don’t moor in between locks on recognised lock flights; it can lead to wastage of water. 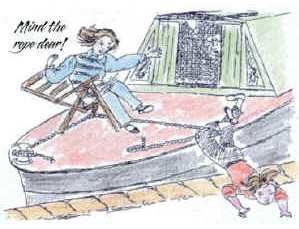 On a narrow lock flight this creates an obstruction to navigating a butty (unpowered boat normally towed by a motor boat) which is usually pulled by a long rope from lock to lock in the traditional way. If you have no option, please be considerate to such craft and keep your roof adornments (especially aerials) down during daylight hours. On rack and pinion mechanisms, set the safety catch before starting to wind a paddle. Never leave windlasses on paddle gear if you are not winding the paddle – they can fly off and damage limbs and heads (bystanders as well as yours). Never jump down on to a boat from a lock side – if you slip you could be squashed. Always have at least one person attending the boat to ensure it does not get caught on cills etc. Avoid contact with either set of gates. An unwatched boat is usually the one where an accident could ensue. The steerer should stay in control of the boat. It is a good idea to assign one adult purely to supervise small children. Small children should always wear buoyancy aids when in the boat cockpit/rear deck, on locksides or walking/playing near the water’s edge. Persuade children especially, but others as well, not to run along the side of locks. 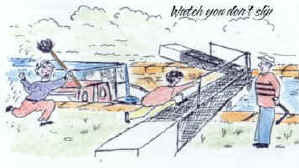 Children (or adults) should not be on the roof whilst the boat is in a lock or on a river. Don’t be upset if someone points out these dangers. Most owners are aware of the need to keep dogs under control. 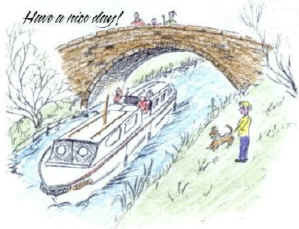 On the waterways, especially at locks etc, uncontrolled dogs can be a hazard. Always keep ropes coiled for use – do not allow them to lie in a heap on deck. Practise throwing a rope so you can do it when the need arises. Avoid trapping fingers in ropes or between ropes and bollards. Don’t let the rope wind around the hands or feet whilst manoeuvring the boat. Watch out for ropes trailing in the water – they could get wrapped round the propeller. If you do get a rope or anything else round the propeller, ensure the engine is stopped and switched off before lifting the weed hatch cover. Do not restart until the cover is back in place. People have lost fingers, hands and feet ignoring this rule. Remember to check the hatch is secure and ensure there is no leakage. A leak could flood and sink the boat. Whilst the general rule is pass ’port to port’ (i.e. to the right), there may be situations where it is safer not to do this – eg passing in a lock pound when one boat has got seriously out of position, where the lock or bridge is at a difficult angle, or where one boat is preparing to moor. Watch out for situations to pass ‘wrong side’ and indicate your intention by using the recognised sound signal (two blasts on the horn). Many experienced boaters are not familiar with sound signals, and it would do no harm if they were to learn! If you do overtake, generally do so on the left. Travelling through a tunnel the first few times can be daunting. Some tunnels are wide enough for two boats to pass, but some are for single way working only. These will be identified in your waterways guidebook. In the dark it is difficult to steer a straight course and easy to lose your bearings, so go slowly. A useful tip is to switch on some cabin lights – these will light up the tunnel wall and help you judge how close you are. Slow right down when you get near to an oncoming boat to give each other maximum clearance. Make sure your tunnel light is adjusted so it does not dazzle oncoming steerers. You will find you get the best guide to your position by having it shine slightly to the right onto the roof of the tunnel. If you go aground, the best way off is to reverse slowly back the way you have come. Going faster in forward gear will usually result in you sticking tighter! Remember the slower the propeller revolves the more water you will have underneath the boat. It can be quicker not to use the engine at all but to push the stern off with the boat pole and then reverse into deeper water before straightening up. Don’t have your crew standing at the end that’s stuck – move them away and you’ll gain a couple of inches depth straight away! There are still quite a few motor boat and ‘butty’ pairs cruising. Some are hotel boats with paying guests, some are working boats and some enthusiasts. Even in experienced hands they can present problems. It is quite difficult to stop a pair without the butty (the towed boat) jack-knifing. At very slow speed in wind the butty can be blown off course. Always give way to a ‘pair’ travelling downstream. Please allow for these eventualities, especially when meeting a pair at a bridgehole – give way even if you think you will get there first! Such a pair of boats will normally have a deeper draft than a modern boat. Be ready to give them the centre channel, and for them to be towards the outside of a long bend, whether they are on the correct side or not. If you meet a butty being bow hauled by its crew pulling a rope from the tow path remember to pass on opposite side to the rope! When a pair is going to moor they will probably stop in the channel to ‘breast up’ (tie together side by side). Be prepared for this and give way. Boating is one of the few activities left where we can relax, take things easy, but at the same time enjoy doing things correctly, efficiently and safely. Members of these organisations will often display on their boats a burgee or window sticker of their organisation. Look for the sign – we hope the crew will have read this guide and be ready to help! We don’t expect and would not wish everyone to be forever trying to ‘teach’ everyone else! A readiness to help in certain circumstances, perhaps to explain, assist and encourage, has got to be a good thing. It is certainly better than just being grumpy and complaining.